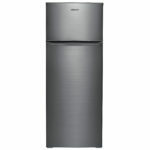 Compact fridge in stainless steel design for office or small apartment. The total capacity is 212 l, the freezer compartment capacity is 41 l. The energy saving class is A+. 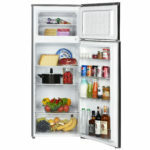 The refrigerator control is mechanical, there is LED lighting and the option to override the doors. The refrigerator compartment has three main shelves and four shelves on the door, as well as a zone for storing delicate products, vegetables and fruits. The interior space will suffice for a sufficient amount of fresh food, jar, drinks and freezes. In the freezer compartment, which is located on top, there is a shelf-grille, which divides the camera in half. 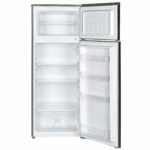 The refrigerator’s height is 142 cm, width is 50 cm and the weight is 39 kg. 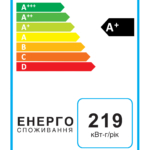 Ardesto DTF-212X perfectly fits in a small room, for example in an apartment studio or a compact office.